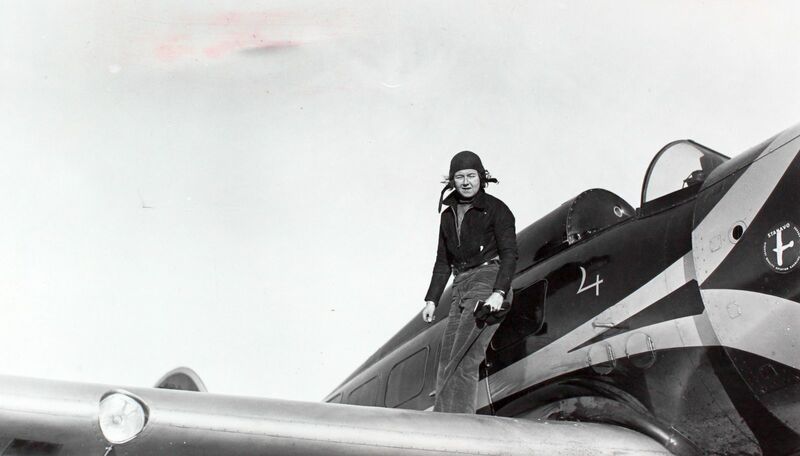 11 July 1935: At 5:31 a.m., Eastern Daylight Time, (01:31 UTC) Laura Houghtaling Ingalls took off from Floyd Bennett Field, Brooklyn, New York, and flew non-stop across the North American continent to the Union Air Terminal, Burbank, California. She landed there at 8:51 p.m., Pacific Daylight Time (19:31 UTC). The elapsed time of her non-stop transcontinental flight was 18 hours, 20 minutes, 30 seconds. After departing Floyd Bennett Field, Ingalls flew along a commercial airway defined by radio beacons. 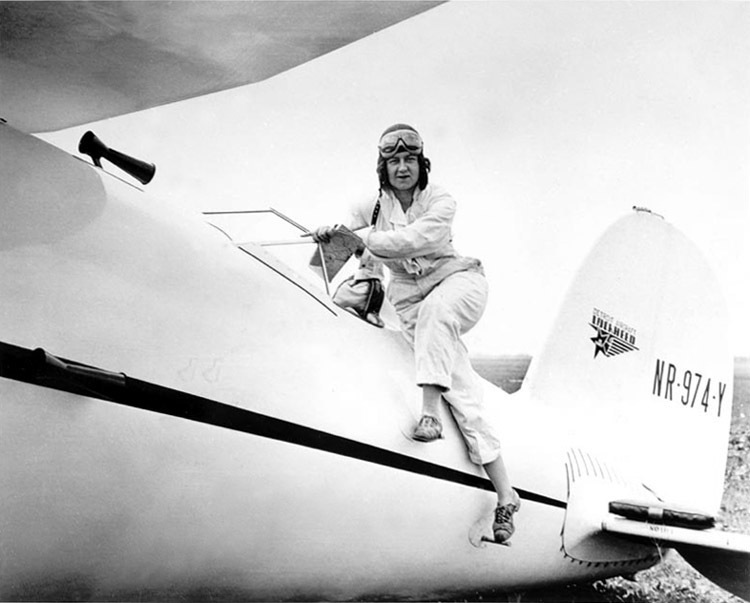 Her route of flight was from Brooklyn, New York, to Pittsburgh, Pennsylvania—Columbus, Ohio—Indianapolis, Indiana—Kansas City, Missouri—Albuquerque, New Mexico—Burbank, California. 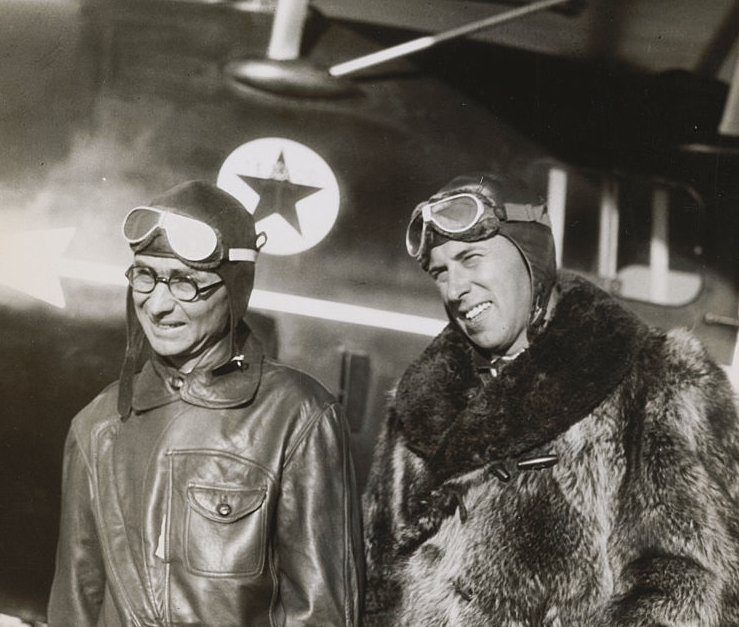 This was only the third time that a non-stop transcontinental flight had been accomplished. 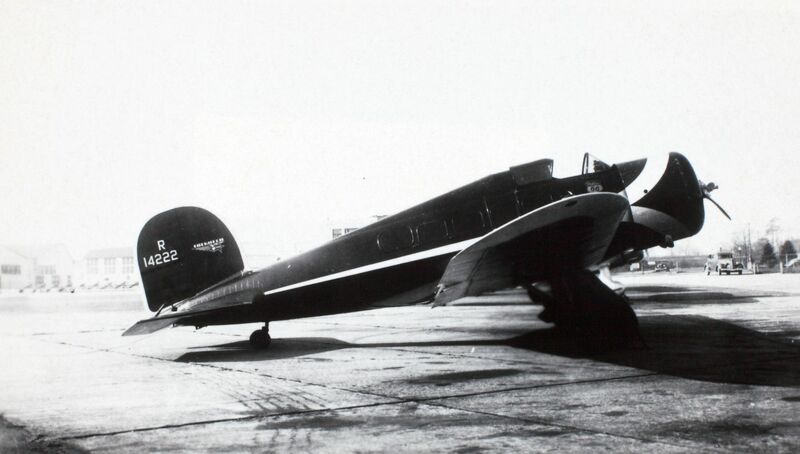 Her airplane was a single-engine Lockheed Model 9D Orion Special, registration NR14222, which she had named Auto da Fé. ¹ Ingalls had taken delivery of the Orion at the Lockheed Aircraft Company, Burbank, California, 1 February 1935. Contemporary newspaper reports said that the “Black Mystery Ship” cost $45,000. 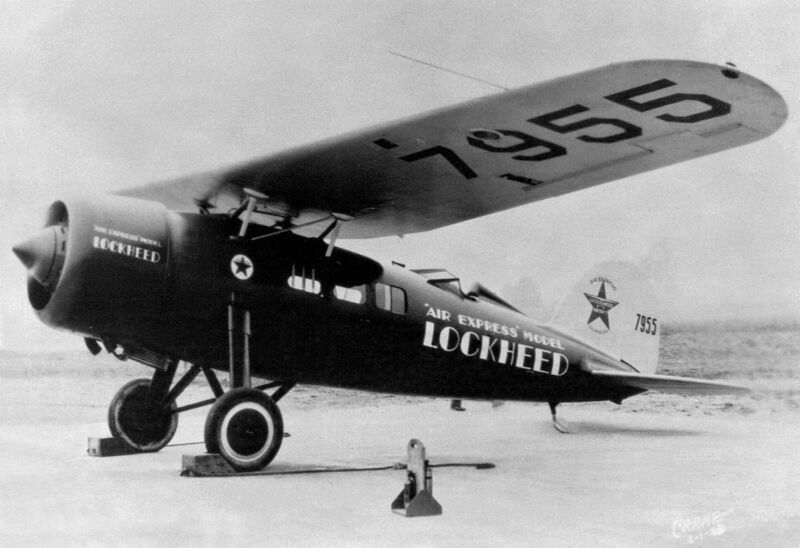 The Lockheed Model 9 Orion was a single-engine, low-wing monoplane, designed in 1931 by Gerard Freebairn Vultee for airline use. It was capable of carrying six passengers in an enclosed cabin. The Orion was the first commercial airliner with retractable landing gear. It was faster than any military airplane in service at the beginning of the decade. Like other Lockheed aircraft of the time, it was constructed of strong, light-weight, molded wood, but the Orion would be Lockheed’s last wooden airplane. The Lockheed Orion 9D was 28 feet, 4 inches (8.64 meters) long with a wingspan of 42 feet, 9¼ inches (13.04 meters) and height of 9 feet, 8 inches (2.95 meters). It had an empty weight of 3,640 pounds (1,651 kilograms) and maximum takeoff weight of 5,200 pounds (2,359 kilograms). 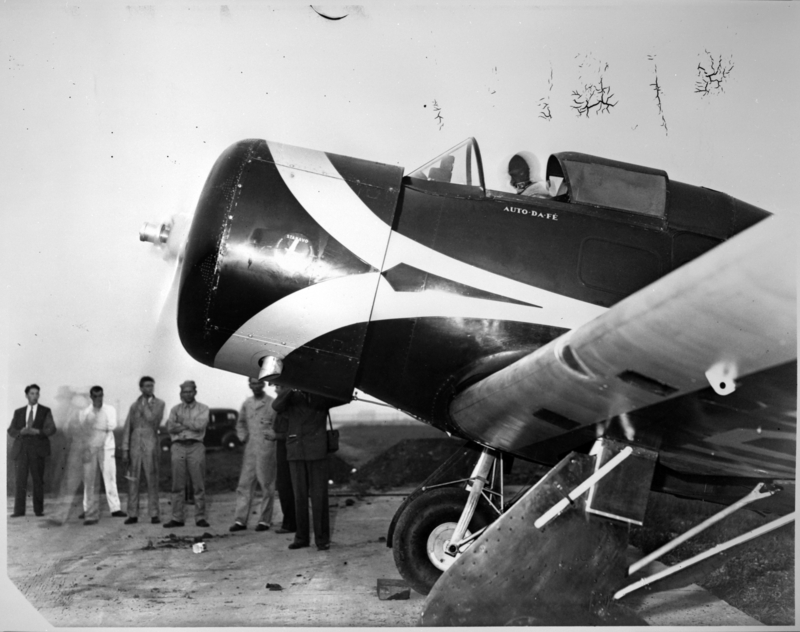 Auto da Fé was powered by an air-cooled, supercharged, 1,343.804-cubic-inch-displacement (22.021 liter) Pratt & Whitney Wasp S1D1 nine-cylinder radial engine. The engine had a compression ratio of 6:1 and was rated 525 horsepower at 2,200 r.p.m. The S1D1 was a direct-drive engine, which turned a two-bladed Hamilton Standard variable-pitch, constant-speed propeller. The Wasp S1D1 was 4 feet, 3.438 inches (1.307 meters) in diameter, 3 feet, 6.625 inches (1.083 meters) long and weighed 763 pounds (346 kilograms). 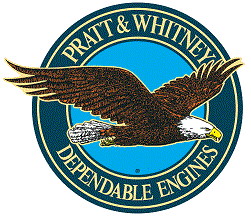 The engine was enclosed by a N.A.C.A. cowling. The cruise speed of the Orion was 205 miles per hour (330 kilometers per hour) and the maximum speed was 220 miles per hour (354 kilometers per hour) at Sea Level. It had a range of 750 miles (1,159 kilometers) in standard configuration. The service ceiling was 22,000 feet (6,705 meters). 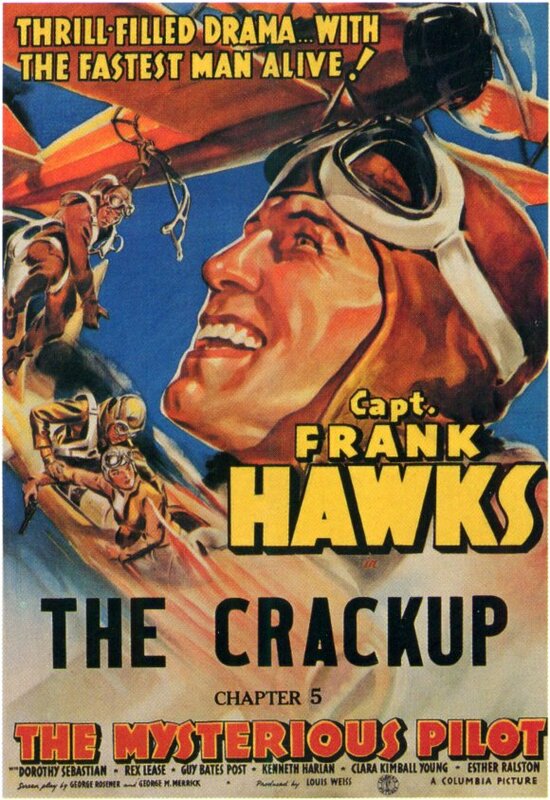 Ingall’s airplane had a fuel capacity of 630 gallons (2,385 liters) of gasoline and 40 gallons (151 liters) of engine oil. NR14222 was equipped with a Sperry Gyro Pilot and a Westport radio compass and receiver for navigation. In 1937, NR14222 was sold to Rudolf Wolf, Inc., a burlap company in New York. It was then transferred to Fuerzas Aéreas de la República Española (FARE), the air arm of the Spanish Republican forces during the Spanish Civil War. What happened to the Lockheed Orion after that is not known. Laura Houghtaling Ingalls was born at Brooklyn, New York, 14 December 1893. She was the first of two children of Francis Abbott Ingalls, a cotton goods merchant, and Laura McAlister Houghtaling Ingalls. Miss Ingalls lived in France prior to World War I, and returned there as a relief worker following the War. In 1920, she lived with her family in Tuxedo Park, New York, and was employed as a stenographer. 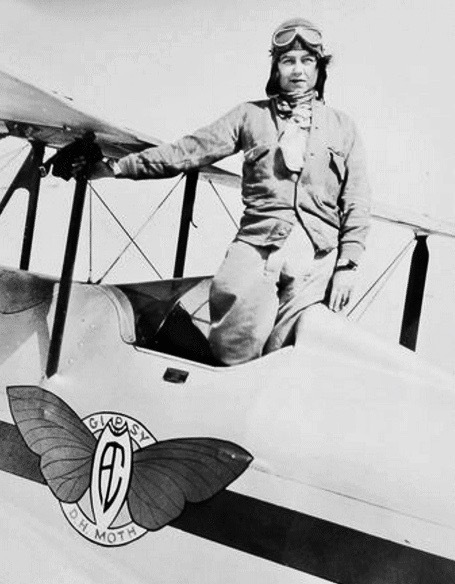 Laura Ingalls began flight training at Roosevelt Field, Long Island, New York, and completed her first solo flight on 23 December 1928. In June 1929, she began training for a commercial pilot certificate at the Universal Flying School, Lambert Field, St. Louis Missouri. Miss Laura Ingalls, who recently received a limited commercial license, has completed her studies at the Universal Flying School and is taking the examination for a transport license under Inspector Fox. Miss Ingalls’ home is in New York, where she is said to have received several offers of work as a pilot. Ingalls qualified for her limited transport license, 12 April 1930. (After qualifying for an F.C.C. 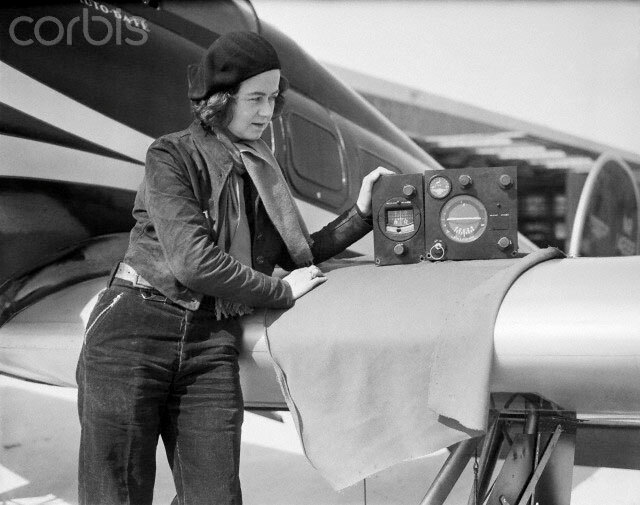 radio-telephone operator license in 1934, her restricted transport license was upgraded to Scheduled Airline Transport Pilot, 26 January 1935.) Her pilot certificate number was 9330. 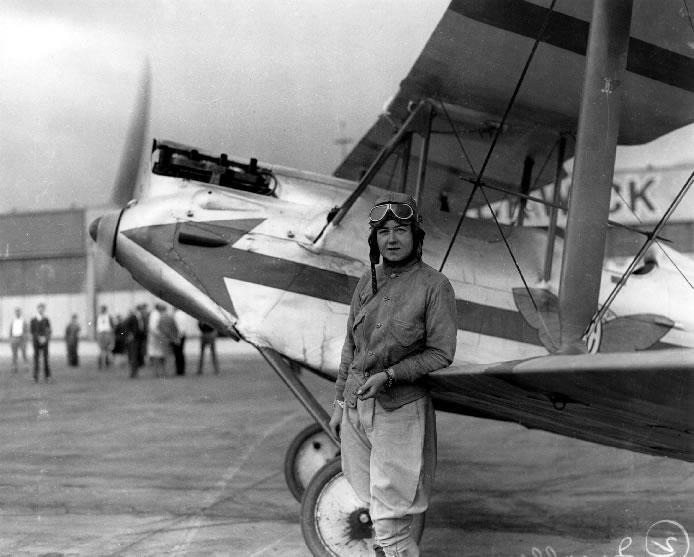 Laura Houghtaling Ingalls rests against the lower wing of her de Havilland DH.60G Gipsy Moth while its engine idles, October 1930. The forward cockpit is covered. Miss Ingalls was the first woman to fly across the country from East to West. In 5 October 1930, she flew NR9720 from Roosevelt Field to Grand Central Air Terminal at Glendale, California, arriving 9 October. The flight required nine fuel stops, and took 30 hours and 27 minutes over four days. 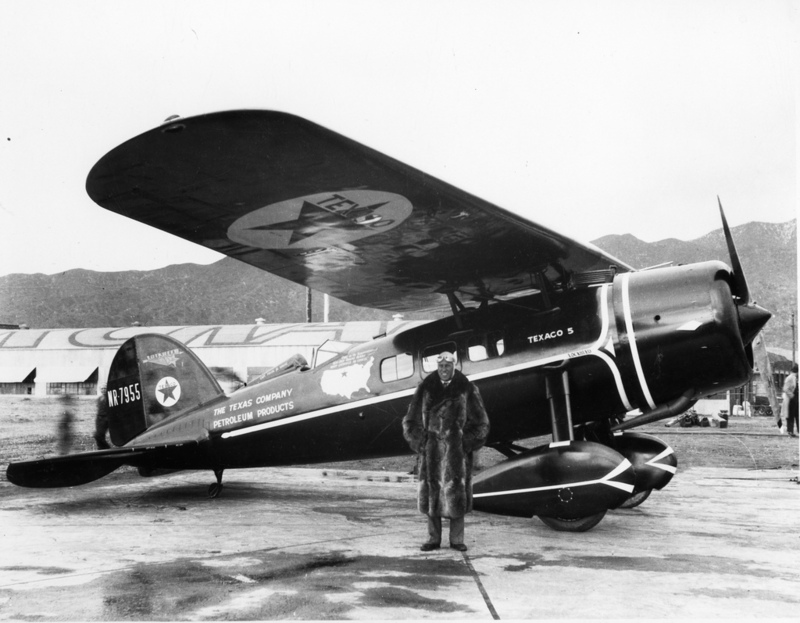 Between 28 February and 25 April 1934, Laura Ingalls flew a Lockheed Model 3 Air Express, NR974Y, on a 17,000-mile (27,400 kilometers) solo flight around South America and over the Andes mountain range. 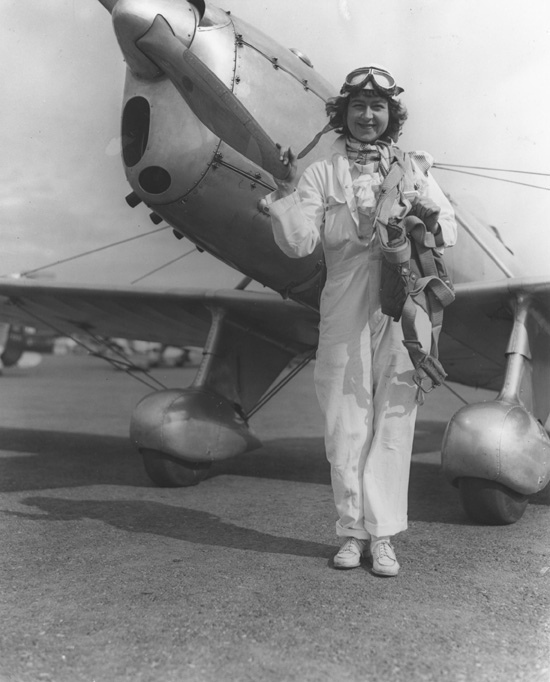 Laura Ingalls was awarded the Harmon Aviatrix Trophy for 1934. 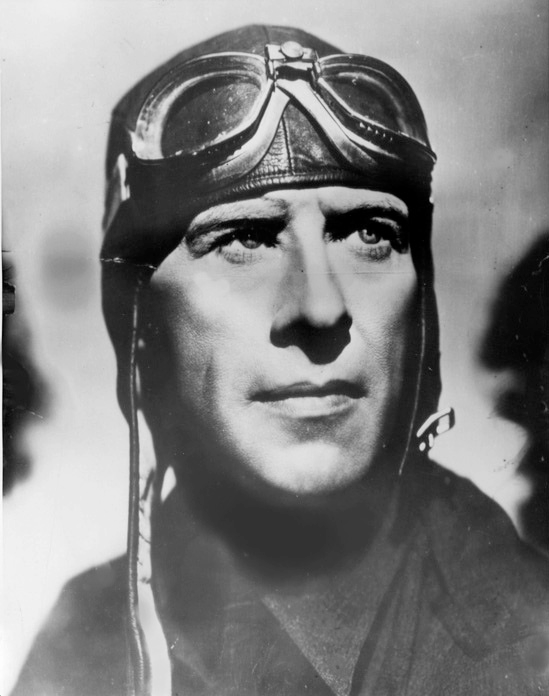 Ingalls flew her Orion in the 1936 Bendix Trophy Race, finishing in second place behind Louise Thaden, with an elapsed time of 15 hours, 39 minutes. Miss Ingalls bought a Ryan ST-A low-wing monoplane, NC18901 (c/n 179), which was powered by a 125 horsepower Menasco C4 Pirate inverted 4-cylinder engine. 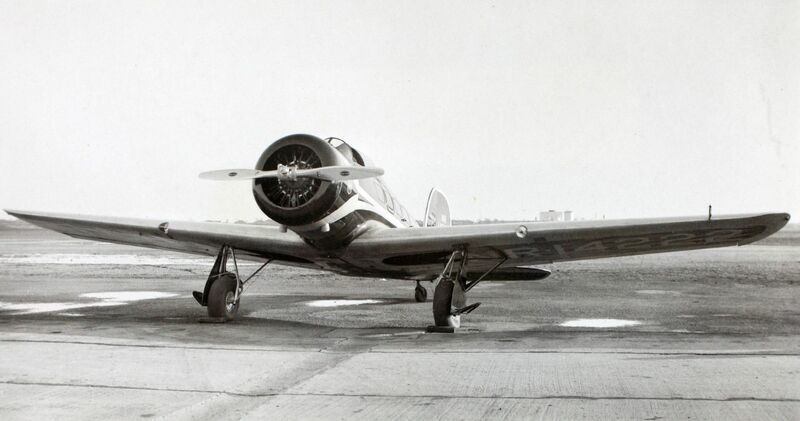 The Ryan ST was developed into the Ryan PT-16–22 military trainers of World War II. 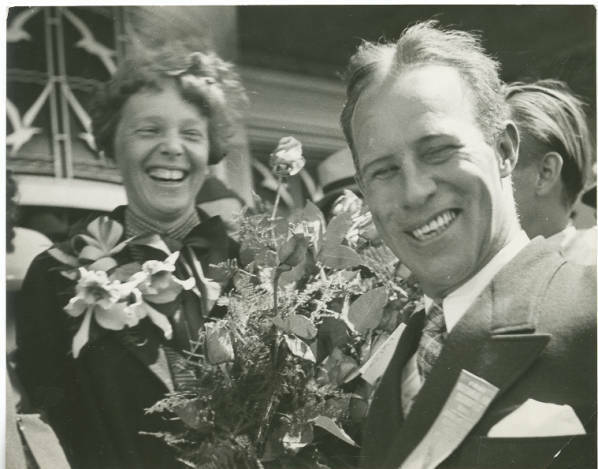 In 1939, Laura Ingalls dropped political leaflets during a 2-hour flight over Washington, D.C. On landing, she was met by representatives of the Civil Aeronautics Administration. Her pilot’s license was suspended by the C.A.A. for violating the airspace surrounding The White House. Some sources indicate that the license was later revoked. Laura Houghtaining Ingalls died at her home in Burbank, California, 10 January 1967, at the age of 73 years. Her ashes were interred at Wiltwyck Cemetery, Kingston, New York. ¹ An auto-da-fé was a public act of penance required of condemned heretics prior to their execution during the Spanish Inquisition. 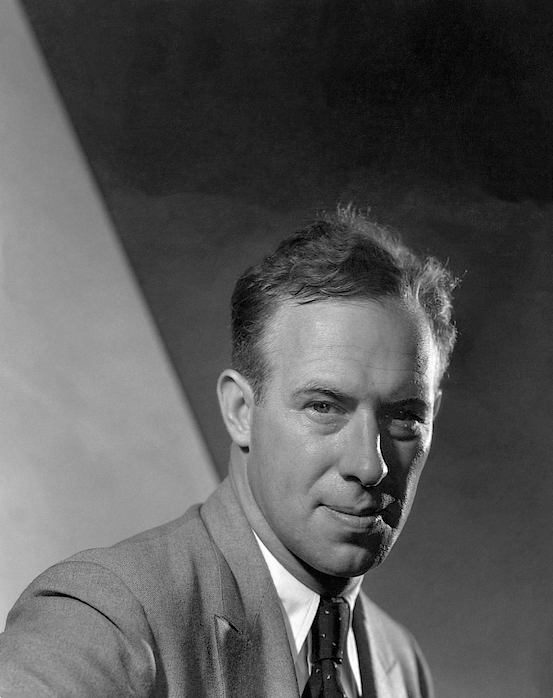 The meaning of the reference on Ingall’s Orion is unknown.